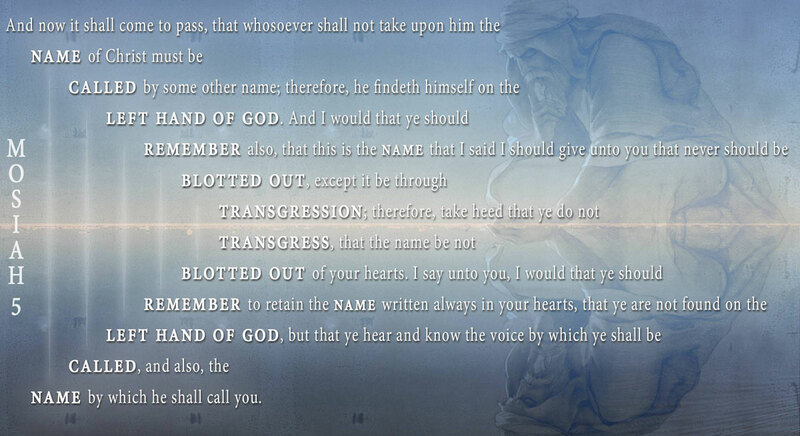 "This is the name that I said I should give unto you that never should be blotted out, except it be through transgression; therefore, take heed that ye do not transgress, that the name be not blotted out of your hearts. I say unto you, I would that ye should remember to retain the name written always in your hearts, that ye are not found on the left hand of God." 1. See Robert F. Smith, “Assessing the Broad Impact of Jack Welch's Discovery of Chiasmus in the Book of Mormon,” Journal of Book of Mormon Studies, 16, no. 2 (2007): 68–73. 2. For a comprehensive list of proposed chiasms in the Book of Mormon, see “Chiasmus Index,” at Chiasmus Resources, online at chiasmusresources.org. 3. John W. Welch, “Chiasmus in the Book of Mormon,” in Book of Mormon Authorship: New Light on Ancient Origens, ed. Noel B. Reynolds (Provo, UT: Religious Studies Center, 1982), 42, 51 n.3. 4. For Christenson’s two translations, see Allen J. Christenson, trans., Popol Vuh: The Sacred Book of the Maya (Norman, OK: University of Oklahoma Press, 2007); Allen J. Christenson, trans., Popol Vuh: Literal Poetic Version (Norman, OK: University of Oklahoma Press, 2007). Not all examples of chiasmus and other poetic structures get lost in the free translation. In fact, many do survive—though they undergo some modification and are more obvious in the literal poetic translation. 5. Gerhard Tauberschmidt, Secondary Parallelism: A Study of Translation Technique in LXX Proverbs (Atlanta, GA: Society of Biblical Literature, 2004), 12. 6. Edward F. Campbell Jr., Ruth: A New Translation with Introduction and Commentary, Anchor Bible Commentary, Volume 7 (New York, NY: Doubleday, 1975), 62. 7. Brant A. Gardner, The Gift and Power: Translating the Book of Mormon (Salt Lake City, UT: Greg Kofford, 2011), 309. 8. Gardner, Gift and Power, 309. 9. John W. Welch, “Chiasmus in the Book of Mormon,” in Chiasmus in Antiquity: Structures, Analyses, Exegesis, ed. John W. Welch (Hildesheim: Gerstenberg Verlag, 1981; reprint Provo, UT: Research Press, 1999), 208. For the extensive use of chiasmus in Mosiah 2–5, see Book of Mormon Central, “Why Did King Benjamin Use Poetic Parallels So Extensively? (Mosiah 5:11),” KnoWhy 83 (April 21, 2016). 10. See Carl J. Cranney, “The Deliberate Use of Hebrew Parallelisms in the Book of Mormon,” Journal of Book of Mormon Studies 23 (2014): 140–165. 12. See Gardner, Gift and Power, 197–204, 239–240. 13. John W. Welch, “What Does Chiasmus in the Book of Mormon Prove?” in Book of Mormon Authorship Revisited: The Evidence for Ancient Origins, ed. Noel B. Reynolds (Provo, UT: FARMS, 1997), 220–221. 14. Welch, “What Does Chiasmus in the Book of Mormon Prove?” 220. 15. For more on how chiasmus shows the subtle craftsmanship of the Book of Mormon, see Book of Mormon Central, “Why Was Alma Converted? (Alma 36:21),” KnoWhy 144 (July 15, 2016). 16. For an example of this, see Donald W. Parry, Poetic Parallelisms in the Book of Mormon: The Complete Text Reformatted (Provo, UT: Neal A. Maxwell Institute for Religious Scholarship, 2007). Altogether, Parry displays 1600 examples of 23 different forms of parallelism in the Book of Mormon. 17. See Book of Mormon Central, “Why Was Chiasmus Used In Nephite Record Keeping? (Helaman 6:10),” KnoWhy 177 (August 31, 2016). 18. Book of Mormon Central, “Why Does the Book of Ether Begin with Such a Long Genealogy? (Ether 1:16),” KnoWhy 235 (November 21, 2016). 19. Book of Mormon Central, “Why Is The Presence Of Chiasmus In The Book Of Mormon Significant? (Mosiah 5:10–12),” KnoWhy 166 (August 16, 2016). 20. This also helps to show how central Christ is to the message of the Book of Mormon. See Book of Mormon Central, “Why Did Nephi Use Chiasmus To Testify Of Christ? (2 Nephi 11:3),” KnoWhy 271 (February 6, 2017).